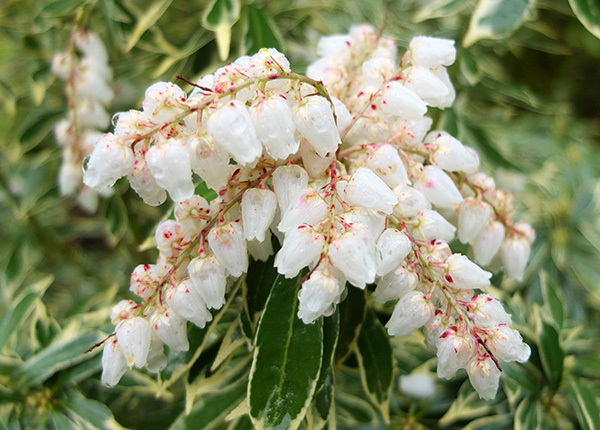 Until last year Pieris have been treated rather rudely in my garden. To improve their standard of living I released one from dry, substandard soil in a confining pot, and shifted another out of a sun-baked border. 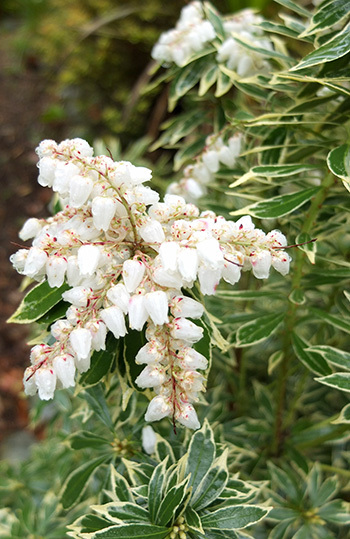 And, using the most obvious common sense not always known to this gardening woman, I planted these strugglers right next to the only thriving Pieris in my garden - a tall, compact evergreen shrub with variegated, fine leaves, happily growing on the sheltered edge of Duck Lawn. 'Grows best in partial shade?' Yes, definitely. And absolutely not suitable for a pot - so sorry about that! The pretty 'lily of the valley' flowers hang in dense panicles, and cover the shrub in spring. As long as the shrub is a happy one, that is. My pot Pieris hardly flowered ever. Lesson learnt. The scale of the flowers seems small in my garden of big borders, and the colour very subtle, so I'm really glad I've planted them in a group. All my shrubs have pretty, variegated cream and green leaves and cream flowers. The most normal of the hybrids, I suspect, but oh so pretty. And happy at last, in the right place, with good friends.